Home→Uncategorized→Looking for a great science assembly for your elementary school in 2018 and 2019? ← Mousetrap Machine Science Show on Facebook! Are you a PTO / PTA member or elementary school principal looking for a great science assembly for the ’18-’19 school year? The Mousetrap Machine Science Assembly is now booking for the current school year! 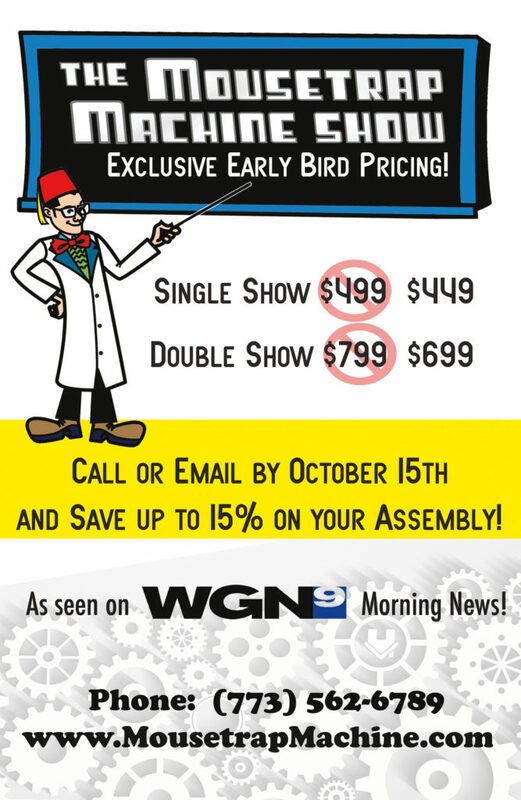 Plus if you get your booking in by October 15th, you can save 15% off our standard assembly fee. Our schedule books up fast, so don’t wait – give us a call at 773 562 6789 or email to info@mousetrapmachine.com to book your assembly this year!